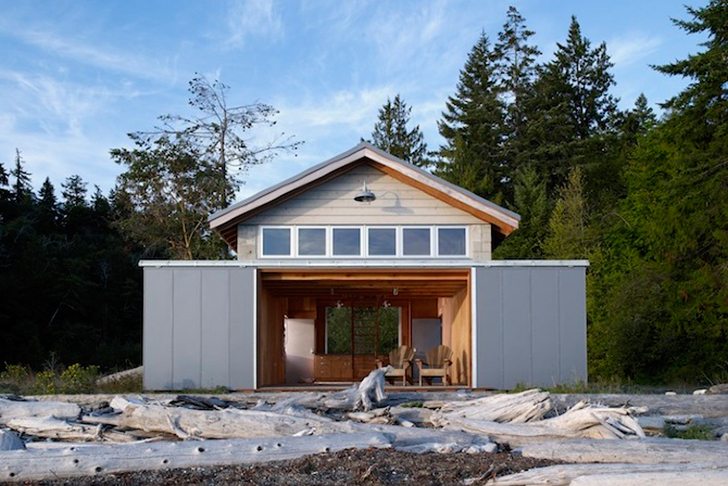 Seattle-based Bosworth Hoedemaker have renovated a 1950's boathouse into a sleek, tiny house. 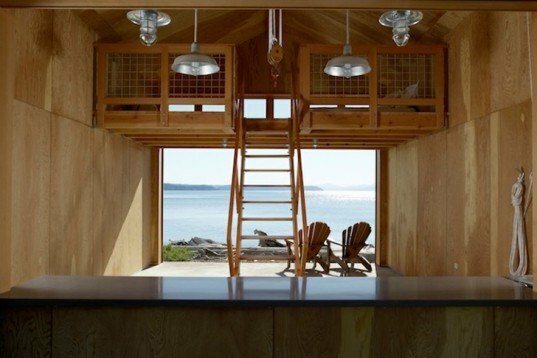 Located in a breathtaking area of the Hood Canal fjord in the US, the Hood Canal Boathouse now doubles as the hub for beach activities as well as a shelter for the family and guests. Click through the photos to discover this one-of-a-kind marine cottage! The Hood Canal Boathouse was once a lightless and uninspired concrete block shelter for storing boats. Without altering the height or its footprint, Bosworth Hoedemaker have created a totally new structure with oversized sliding doors on its side. When the doors are closed its hard shell protects it from vandalism and theft, but when they are open they create two outdoor “rooms” on either side providing shelter from off shore breezes. In contrast with its hard looking exterior, the inside of the house is warm and the walls are made from locally sourced plywood featuring beautiful grains. The stairs towards the bedroom were made from salvaged wood and can be lifted to make room for storing the family’s boat during winter. With an aesthetic that is both modern and timeless, the Hood Canal Boathouse is the perfect cozy space for relaxing after a day of sailing. The Hood Canal Boathouse was once a lightless and uninspired concrete block shelter for storing boats. Without altering the height or its footprint, Bosworth Hoedemaker have created a totally new structure with oversized sliding doors on its side. When the doors are closed its hard shell protects it from vandalism and theft, but when they are open they create two outdoor “rooms” on either side providing shelter from off shore breezes. In contrast with its hard looking exterior, the inside of the house is warm and the walls are made from locally sourced plywood featuring beautiful grains. The stairs towards the bedroom were made from salvaged wood and can be lifted to make room for storing the family's boat during winter. With an aesthetic that is both modern and timeless, the Hood Canal Boathouse is the perfect cozy space for relaxing after a day of sailing.